Well, you also need a horse race. Thank heavens for television! Going to the Kentucky Derby is the best way to experience it. Though I do hope to do it again some time, if I don’t manage that, I’ll be okay with it. The memories are grand, even with the rain we had last year. Louisville, a town with plenty of great food & fun things to do, just buzzes with excitement over the several days of Derby activities. The Churchill Downs race track, with 150,000 guests, boils over with such interesting scenery that it’s a wonder I didn’t injure any eye muscles. There’s the obvious eye candy: all the colorful hats, fascinators, bow ties, suits, and dresses that you’d expect, plus a few surprisingly elegant or garish ones. There’s also a great number of other out-of-the ordinary things like gorgeous horses, their trainers, owners, riders, the betting windows, the julep vendors, the insanely long but nevertheless enjoyable (likely because I’d only had one julep by then) line for the ladies’ room, the friendly people in the box next door, the drunk people in the box in front, the Syracuse fan who liked my orange and blue outfit, the race track venue itself, and even the horse I chose, which came in … nearly dead last. Alas, poor Frac Daddy. There is just so much to see, which surprisingly isn’t conveyed well via the NBC coverage. However! A very close runner-up to going there would be to throw a Derby party, wherever you may be on the first Saturday of May in the afternoon. A few bonuses that I’ve just identified: less expensive juleps, the option of going barefoot when your feet can’t stand the heels any longer, and zero worries about rain. These were our discoveries, when we hosted such a party this year. I’m so glad we did it, despite some stress that very morning, when I had neither hat nor pimiento sandwiches ready when I’d hoped to have them ready. Details on the party follow, partly as notes for me, if we do this again, but partly also to share what worked for us. Maybe you would like to celebrate Derby, spring, getting crafty, and/or friends with a party, too? Go for it. Juleps! Of course. Herein we’ll find the one item I’d like to refine, before next year. 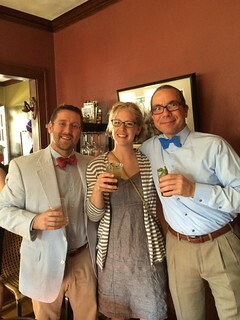 We had about 20 guests, and I made probably 25 or so juleps, not counting the one I needed before the party started. We were unable to find crushed ice, so I had to make it on the fly with our very capable but also very loud VitaMix, and it took me away from the party, if briefly. This is the recipe we used, though I had higher-proof (Old Granddad 100) whiskey and everyone at the party was new to juleps and/or bourbon, so I reduced the bourbon amount to 2 ounces. Either people were putting me on, or they were very happy with their drinks. If you have a tip on making volumes of juleps, let me know in the comments of this post! Perhaps we just need to get a new fridge that crushes ice, in the next year. Ours is older and likely inefficient, anyway. A few other whiskeys, and some ice. Templeton Rye, Buffalo Trace, and Knob Creek Single Barrel. And some Laird’s Applejack, which I think everyone avoided. Plus water, a few sodas, wines, and plenty of beer. Creamy cheese grits with chilis. 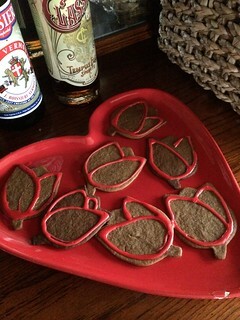 Gingerbread cookies cut into horse, jockey, and rose shapes. I used the Golden Gingersnap Stars recipe from Flo Braker’s Baking for All Occasions. It was a lot of work, and I skipped the gold dust step, but the cookies were and are very tasty and crisp! We’ll be enjoying these with our morning coffee for a week or two. Some store-bought macaroons. I love my own recipe, but I was running out of time and wanted something without nuts and gluten on the menu. 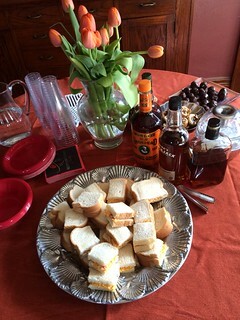 Some great pickles, cheese dip, brownies, and pimento spread, brought by guests. Yum! Watching the TV coverage of the event. We moved the TV upstairs for this. A small part of me was terrified that we wouldn’t get it to work, more due to NBC being a jerk about non-cable subscribers, than about our ability to finesse the big screen TV. Alas, Derby coverage is still free for media cheapskates like us. I was so busy with the juleps that I only watched the coverage before 3:30 pm, when guests started to arrive, and then during the two-minute race itself, around 5:30. I did get to see Jonny Weir’s fabulous Pegasus hat. Inspired, I’m tempted to do something silly next year, like put an ersatz fruit tart on my head. We’ll see; better taste may win out. Simple bets: I designed a one-sheet showing all the horses, with their jockeys, owners, silks colors, and post draw. We invited guests to pick a horse & drop a dollar in a jar. Shockingly, only one person picked California Chrome, and she walked home with $17 in winnings. Getting dolled (and … gented?) up! 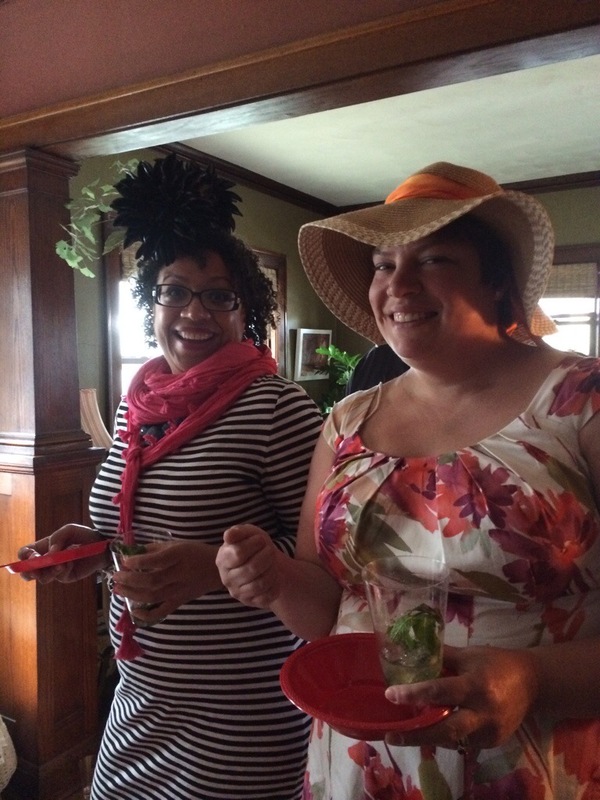 We invited people to dress up for the party, and encouraged them by offering prizes for the best bow tie and ladies’ hat. Our friends got very imaginative and filled with nerve! It was fun to award prizes, and even more fun to see our house full friends in seersucker, ties of various flavors, feathers, flowers, and even a felt piglet. Our prizes were two pairs of commemorative Derby glasses, each filled with a miniature rose bunch. We kept the TV upstairs until the next morning. A few hours after the party, PBS aired the Katharine Hepburn/Spencer Tracy film ”Woman of the Year” and I watched a middle portion of it. 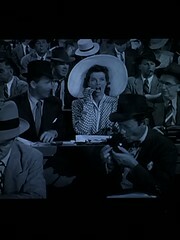 In it, the stars attended a sporting event or two, and of course did so very fashionably, as it was a 1942 movie. I’m not exactly sure why I have the 1940s in my mind when I think of Derby, but I do. After all, the very first Kentucky Derby was in 1875! Perhaps any black-and-white picture with hats would do. 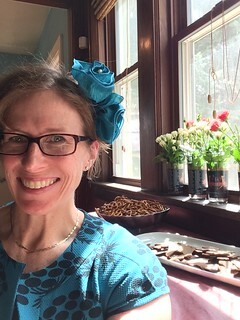 At any rate, watching men and women in hats, from my perch on the couch, bare-footed and snacking on party leftovers, was a nice way to finish a long, busy, yet very fun Derby day. Cheers!